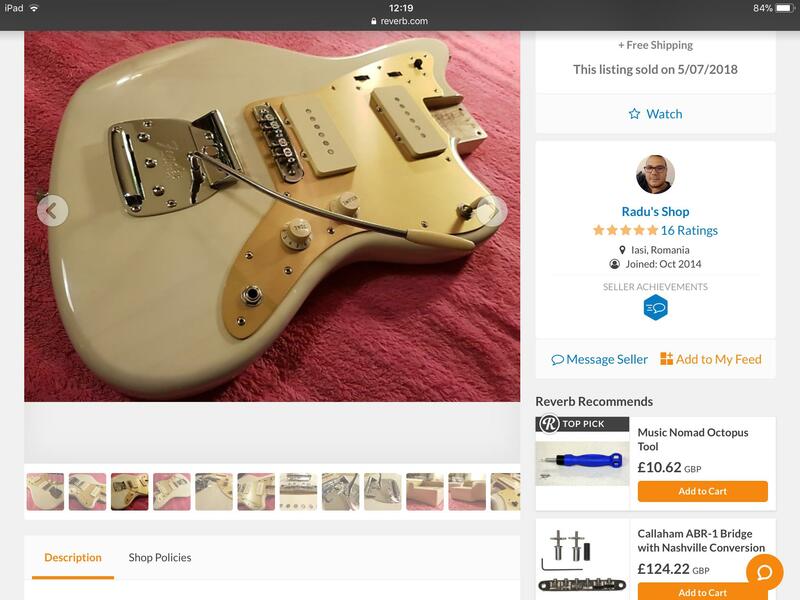 It’s beautiful...but it seems weird to have a 1959 thinskin that has the same specs and parts as the AV65 Jazzmasters. They probably copied and pasted the specs from the AV65, since they don't fit with the paragraph describing the guitar. We probably won't get the real specs till later. One problem with that theory: AV65s don't have gold aluminum pickguards or chrome flat-top knobs. The alder part is clearly a typo, and maybe they do have different pickups, but the rest of the specs look accurate. Also keep in mind Wildwood/Fender are known to change the pickups on Thin Skins without warning. I've seen their thin skin Teles ship with one set of pickups one week, then another the next. It seems Fender just throws in whatever they have lying around for them. Where can I get that Pickguard for my AV65 JM? This is mine, it’s quite a nice pale gold, fitted well, just a bit of minor sanding around the neck pocket, and also a very gentle (you don’t want to take off the colour) run around the perimeter with some sandpaper to remove the burrs. Funny they get the specs twisted. I don’t know about anyone else, but I can’t lay down that kind of scratch in a pre-order without knowing the specs. Hmmmm, curious that they reissued these again. Always wanted one of those but they're nearly impossible to find these days. I don't know what it is, but something about these seems different from the previous reissue? Maybe it's just the photos of the prototype? It's like the older '59 ri had a more aged look? Not relic'd, but maybe just aged dots like someone mentioned? Something seems off. I"m wondering if this is going to drive up the prices on the former reissues whenever people decide to sell the older ones. Thanks for the referrals to both Posters. Are both authentic USA Fender Annodized Gold? PickguardsAre they both Aluminum or Metal or Plastic? Made in Holland, not a Fender product. It is a nice brushed aluminium gold anodized finish though. 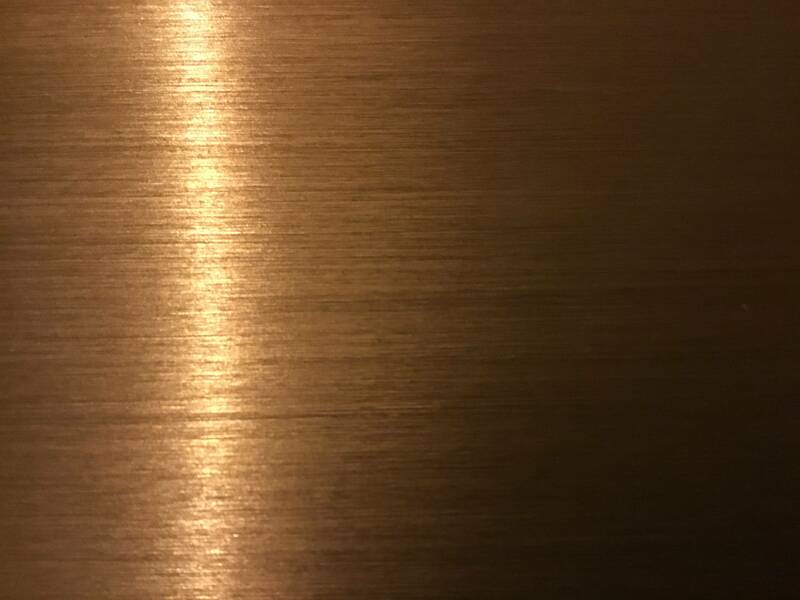 Here’s a close up of the finish, it’s taken in artificial light so looks more gold than it really is, just to show the brushed effect, although I’m not sure the pic does it justice, it looks much nicer on the guitar, see my first pic of the whole guitar in daylight which is a truer representation. Your Guitar looks great in the Pics. Have you seen an actual '59 Reissue in that color? if so, would say it's accurate to the '59 Reissue? Is that French Francs?? Or?? how much USD? I wonder what the neck carve is like, I have a neck from the original 2008 AVRI thinskin 59 on my AV65, it’s super slim but I really like it, although I loved the thicker original AV65 neck too, it was more an aesthetic choice as much as anything. Dunno... my Wildwood '65 has a pretty chunky C - my guess is it'll be that profile since it seems popular, and they are keeping the 9.5" radius. Eyeballing the pic of the back of this one makes me think that's the case. I love the neck on the AV65 guitars so, so much. Really wish it was possible to retain the look of a gloss finish while having the feel of a satin finish though - that’s my only gripe whatsoever. The JMJM hype is well deserved and probably is still my favorite, but the AV65 neck is amazing too. I’ve never played a 59 so I have no idea what a true-to-the-original version would be, but it’d be cool if they actually made it the same as opposed to making cosmetic changes to what essentially is an entirely different guitar and marketing it as a specific year’s reissue. I think you may have our links mixed up, mine is the ebay one, priced £59.99 gbp (at least when viewed from uk). here’s the link again. Why would that guy do that? I've seen & played the previous RI 59 JM & it was a work of Art! Wish I could've bought it but wasn't for sale. Just here to say that thing is extremely lovely and I want one. God dammit. Could just be the pictures, but the pickguard on that new one might be a little lighter, and the white a bit less transparent. Mainly I think the older ones had a really orange neck tint. Where is my soul? I don't know, I don't care, I just have to keep on living in this world. OP w/ an update - they got a few of these in, so I went down and checked the two remaining out (apparently more on the way) and ended up buying one. I compared with a used '58 RI from the Custom Shop, which was certainly nicer (REALLY liked the pickups in the CS guitar), but they compared well. Everything seemed on par with the quality of the other Thin Skins. Pickups are in fact the '62 AVRI pickups, not the '65s. I figured even after a bridge and collett/arm swap, neck shim, pot replacement I'll still come out far enough ahead vs the used CS guitar that it was the right move. Fit and finish are great, neck is comfy, pickguard looks nice. I need to try in my own rig, but my initial impression was that the '62 pickups were warmer than the '65s in my other thin skin, and I liked them.